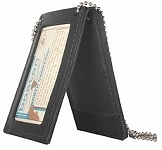 These uniquely designed leather holders allow you to carry any badge on one side and your ID on the other. This badge ID holder is ideal for those who need the simplicity of an around the neck identification for both the badge and ID. Also, the holder has velcro closures that allow for the added versatility of on-the-belt or in-the-pocket use. Hence the NPB (neck, pocket, belt) code. Fits any badge we have. 1. I would buy from this seller again. 2. Received my product a 2 full days prior to the earliest expected date. 3. The product is of excellent quality!